Summertime is here and grilling season is on. Living in California, we have an abundance of avocados at our fingertips and I’m such a huge fan. Not only do avocados taste delicious, they are extremely nutritious as well. Avocados provide you with a fabulous source of fiber and vitamins E & C – super great for glowing skin and antioxidants. 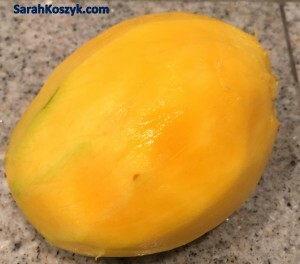 The mango salsa also has a bunch of anti-aging properties, too, to keep your health strong. Enjoy the outdoors this season with your barbecue. 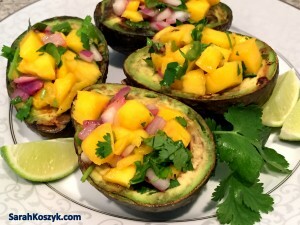 Grilling the avocado, mango, jalapeno, and red onion provide extra flavor and sweetness to this easy-to-make gourmet dish. 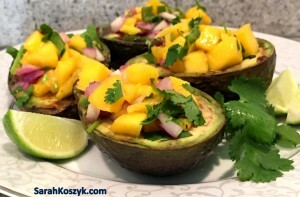 You’ll wow your guests and your taste buds with the Grilled Avocado Stuffed with Grilled Mango Salsa recipe. Summertime is here and grilling season is on. Living in California, we have an abundance of avocados at our fingertips and I’m such a huge fan. Not only do avocados taste delicious, they are extremely nutritious as well. Avocados provide you with a fabulous source of fiber and vitamins E & C – super great for glowing skin and antioxidants. 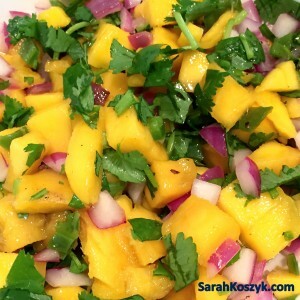 The mango salsa also has a bunch of anti-aging properties, too, to keep your health strong. Enjoy the outdoors this season with your barbecue. 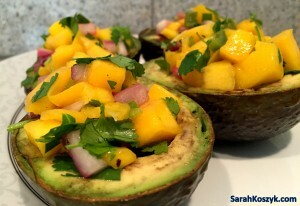 Grilling the avocado, mango, jalapeno, and red onion provide extra flavor and sweetness to this easy-to-make gourmet dish. 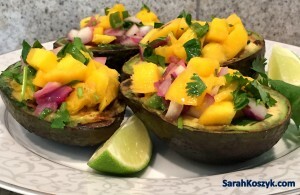 You’ll wow your guests and your taste buds with the Grilled Avocado Stuffed with Grilled Mango Salsa recipe. 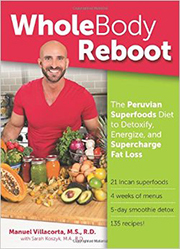 Chop the avocados in half and remove the pit. Keep the avocados in their shell. 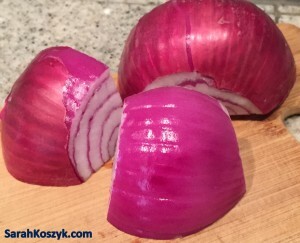 Peel the red onion and leave it in the quarter shape. 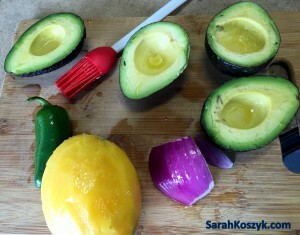 Lightly brush the avocados, mango, red onion, and jalapeno with olive oil and drizzle with 1 Tbsp lime juice. 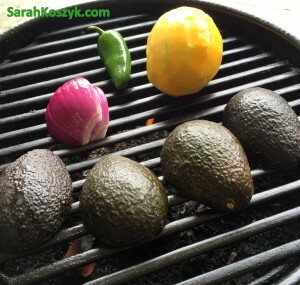 Place the avocado (flesh side down), mango, red onion, and jalapeno on the grill. Grill each side of the mango, red onion, and jalapeno for 4 minutes. 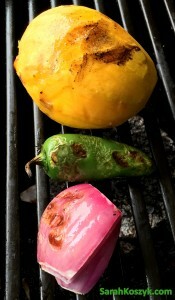 Flip the mango, red onion, and jalapeno onto the other side for another 4 minutes of grilling. Grill the avocado for about 5 minutes or until you get grill marks but it’s not mushy. Remove from the grill. 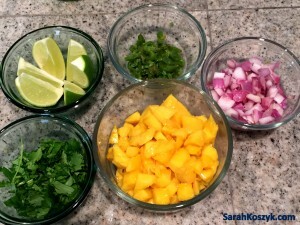 Make the salsa by dicing the mango and the red onion. Slice the jalapeno in half and remove the seeds and finely chop. Chop the cilantro. Slice the lime into wedges. 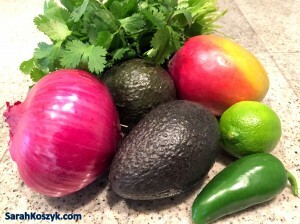 Mix the salsa in a small bowl, by adding the mango, red onion, jalapeno, cilantro, 1 Tbsp lime juice, and salt. 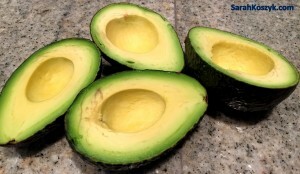 Add the salsa mixture to the hole in the avocados left by the removed pits and serve. Garnish the dish with additional lime wedges.